Overview: Mardi Gras is all about music, parades, picnics, floats and excitement ... Catch carnival fever in this 5 reel, 20 pay-line spectacular online slot. Pursue the substantial winning opportunities this game presents, with up to 5 Free Spins with 10x multipliers, a bonus pick of 3 from 12 shuttered windows on the famous Bourbon Street and some of the most exciting slot action you'll ever come across! 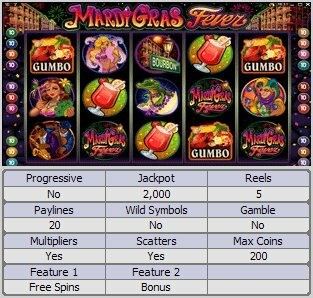 Similar Slots: If you like Mardi Gras Fever, you might like these other 5-reel slot machines: CashOccino, Crazy 80s, Magic Multiplier, Sure Win, Tribal Treasure, Your Lucky Day.